Cyphers, Creatures, and XP on the Fly! The Cypher System was built from the ground up to be easy on the GM–easy to prep games, easy to run games, and easy to change course when those pesky players go off in some unexpected direction. 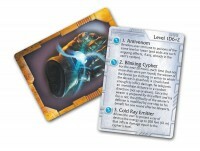 That’s why we thought it would be a cool idea to create the Cypher Deck and Creature Deck. They let you skip the dice-rolling and table lookups and simply draw a card to randomize an encounter or minor numenera item (either when prepping an adventure or at the game table). These two decks, along with the XP Deck, were released as PDFs that you can print yourself or, through DriveThruRPG, have professionally printed on demand. But while we thought this was a pretty nifty idea, we didn’t really appreciate how incredibly useful these decks would turn out to be–or how popular. (They’ve consistently been among our best-selling PDF titles, and are near the top of DriveThru’s most popular card products.) So now we’re rolling them out to the masses (and by “masses,” we mean “game stores”), bringing you not just the three decks in print format, but also a handy storage solution for them and future Numenera cards! 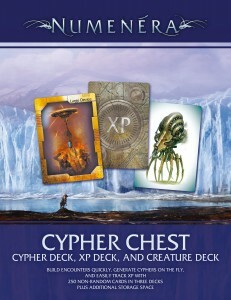 The Cypher Chest is a boxed product containing all three: The Creature Deck, the Cypher Deck, and the XP Deck. That’s over 250 non-random cards. They come together in an 8-1/2″ x 11″ box that will sit nicely on your game shelf with your other Numenera titles. And because these cards just barely touch on all the potential cyphers and creatures your players might one day encounter, there are slots in the box for up to three more decks. 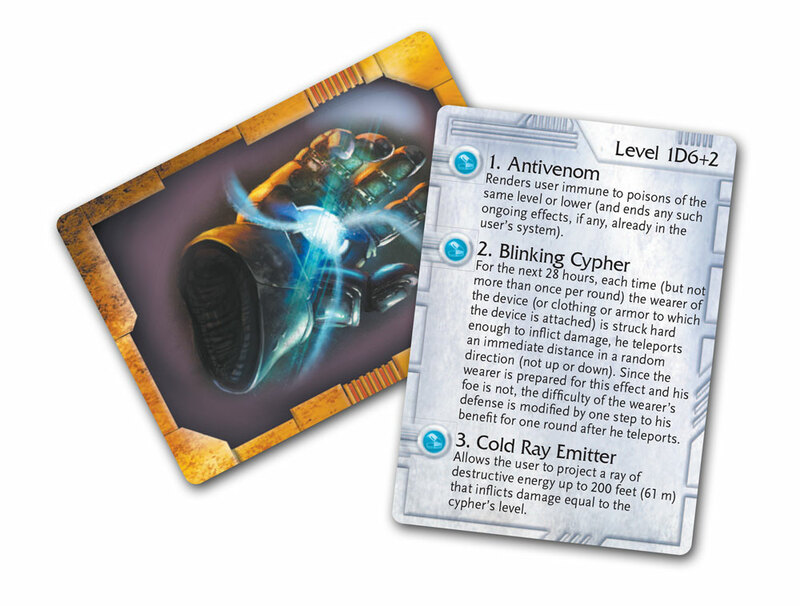 The Cypher Deck allows GMs and players to randomly generate single-use cyphers on the fly. Twenty item cards are lavishly illustrated with different device types, while each of the 100 power cards offers multiple power options to match the device. Pro tip: As long as you’re gentle, you can use a wet-erase marker to circle the power you’ve chosen. Then the player just holds onto the card until the cypher is used, and doesn’t even have to write it on her character sheet! 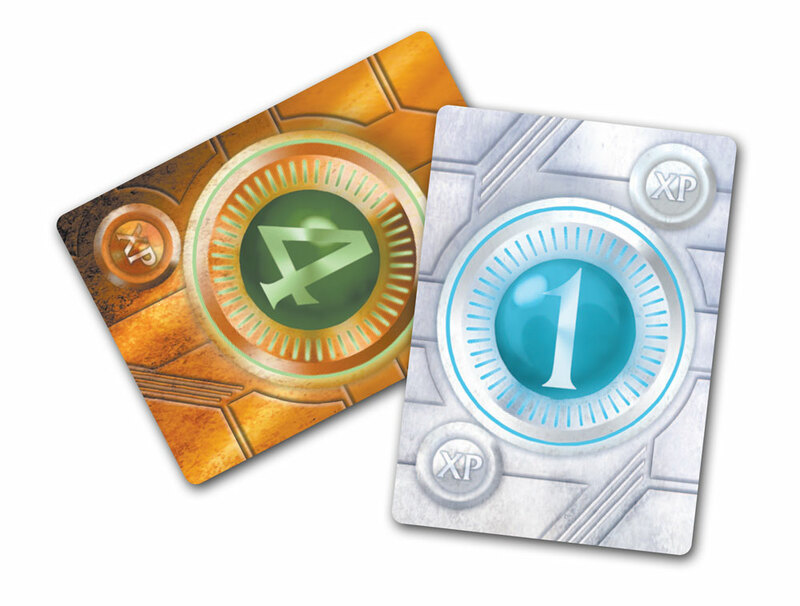 The XP Deck (pictured above) provides a set of tangible tokens to represent experience points—a sort of game currency that often changes hands between players. XP come and go in Numenera; this is a way to keep them flowing without erasing a hole in your character sheet! 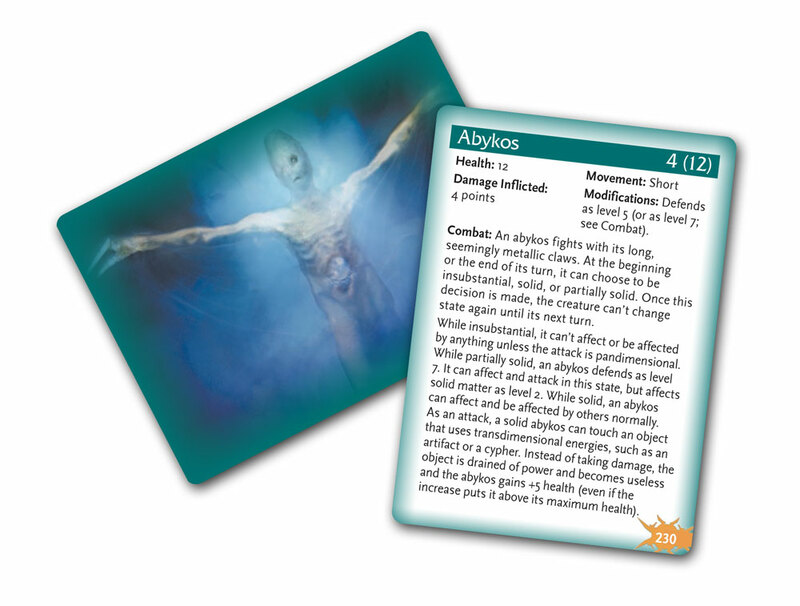 The Creature Deck contains 100 commonly encountered creatures. Draw a card to quickly build an encounter: One side has basic stats (with a reference to the book for full stats and info), and the reverse has an image to share with the players. Really handy when you’re running a game. Or prepping your encounters. Or need to throw an encounter together on the fly! 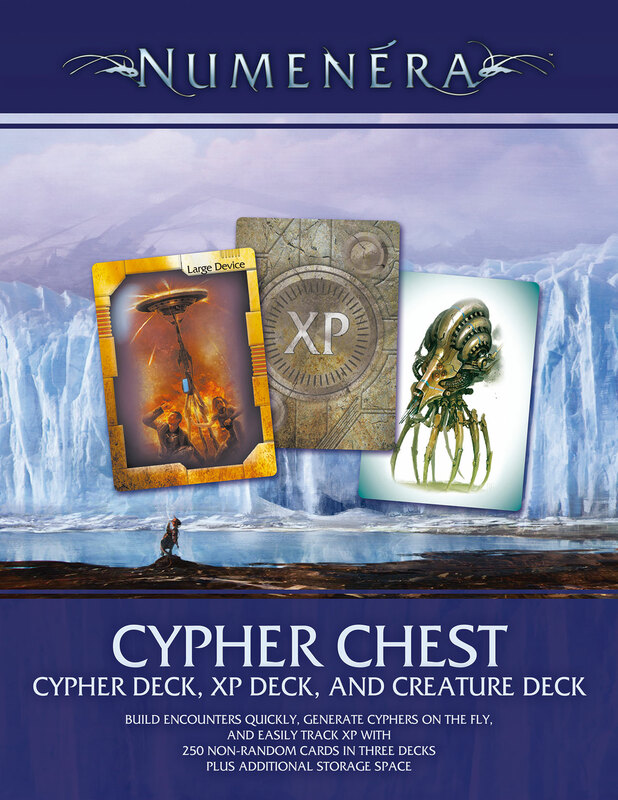 The Cypher Chest will be a boxed set in a 8-1/2″ x11″ rigid box containing 250 non-random, full-color, double-sided cards, for $29.99. It will be out in July.